Framed canvas giclee art print inspired by The Phantom Menace. Limited edition of just 495 pieces! Measures 15 1/2-inches tall x 12-inches wide. 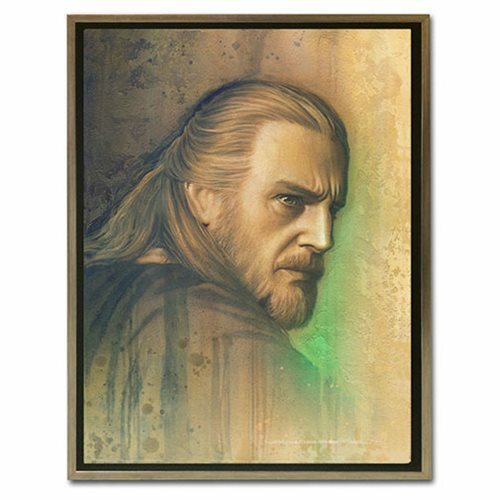 Immortalizing the key and unforgettable characters from Star Wars, the Timeless Series from Acme Archives presents this intense Star Wars Timeless Series Qui-Gon Jinn by Jerry Vanderstelt Framed Canvas Giclee Art Print inspired by The Phantom Menace. A limited edition of just 495 pieces, framed in a brushed metal float frame, it measures 15 1/2-inches tall x 12-inches wide (canvas size 14-inches x 10 1/2-inches) and includes a certificate of authenticity.